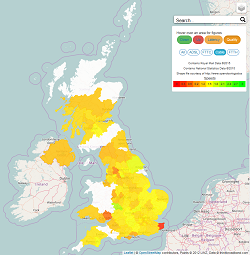 Coverage and speeds in the 650 UK Parliamentary Constituencies. Also view USO/USC postcode overlays and the footprint from various FTTH/FTTP/FTTB services. Data for ADSL, FTTC/VDSL2, cable, FTTH and all technologies combined. Openreach is planning 10 million G.fast premises this map shows which areas we think might be enabled.